There’s a huge mess right now in the heart of Oslo, in every sense of the word. It’s costing taxpayers dearly and now looks likely to land in court, while neighbours suffer from massive disruption and delays. Members of Parliament are demanding answers and accountability. 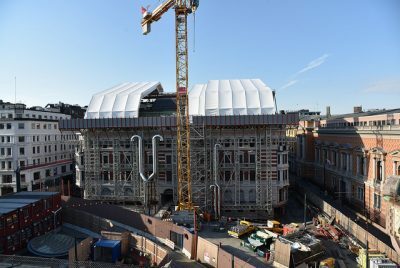 It all started when Norway’s ever-growing Parliament, fueled by a rapidly growing population, found itself in need of more office space, a bigger and more efficient postal and cargo terminal for deliveries and even a new entry to its parking garage. The solution, thought Parliament administrators, was to completely renovate and expand a building complex at Prinsens gate 26 that lies adjacent to the stately old Parliament building (Sortinget). 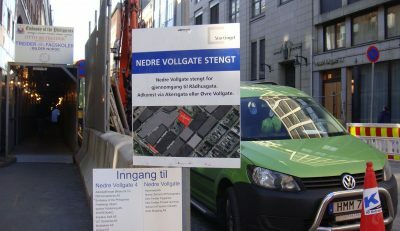 It was also decided to dig a new tunnel entrance for the underground parking garage and new terminal, all the way from Rådhus gate, three blocks away. The project involved once again tearing up the plaza and transit hub right next to Stortinget, called Wesselsplass, that had just recently been renovated itself. 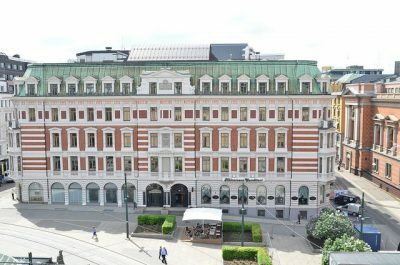 The stately old building that already housed parliamentary offices and Oslo’s iconic bakery and café called Halvorsens Conditori was vacated and closed. Trams and buses were re-routed, streets closed and work began in the summer of 2014. Two years later, the entire area south of the Parliament is one huge, chaotic construction zone that’s made life difficult for hundreds of proverbial innocent bystanders, including the tenants of neighboring buildings and even the Embassy of the Philippines. Their entrances have been blocked, access is disrupted “and it’s just a mess, everywhere,” one frustrated tenant told newsinenglish.no several months ago. It’s gotten worse since. “It’s a big problem,” he said. The situation is even worse, expensive and embarrassing for the Parliament’s leaders who are also left holding a bill that reflects a huge budget overrun. The entire project was initially supposed to cost NOK 1.1 billion (USD 134 million at current exchange rates). That had risen to NOK 1.45 billion in last year’s state budget. Last month, the Parliament had to ask for another NOK 350 million after estimated costs rose again, to NOK 1.8 billion. Newspaper commentators have called the “mess” a “major scandal” that’s now heading to court. 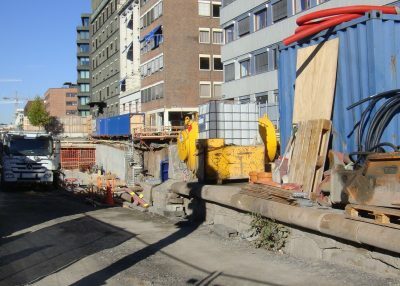 Stortinget is suing the company that was hired to carry out the project, Multiconsult, for alleged feil og mangler (errors and deficiencies) in the basis for contracts with construction companies. 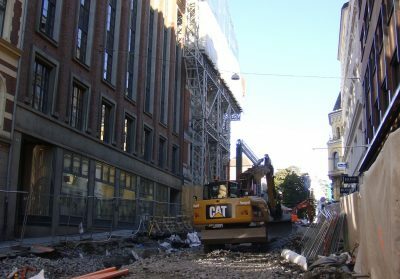 “Major changes” have been made in the building project after construction began, Stortinget’s leaders stated in a carefully worded press release last month. “Additional work costs more when it comes up during the building period, and especially when the changes are so widespread as in this case,” stated the leaders. Stortinget accuses Multiconsult nonetheless of negligence and state broadcaster NRK reported on Friday that the case would go to court, with the state seeking compensation. That may further delay the project that as of last month was supposed to finally be completed in the summer of 2018. Neighbours and public transit passengers thus face at least two more years of disruption. Per Olaf Lundteigen, a Member of Parliament for the Center Party, has been demanding that the project must “have consequences” and the managing director of the Parliament, Ida Børresen is under fire. The matter also has been up for review at the Parliament’s disciplinary and audit committee. Lundteigen wasn’t satisfied and last week was still asking questions: “Who was responsible for following up the money sack on a daily basis? How was the responsibility shared between Multiconsult and Stortinget’s leadership? We haven’t received answers that are good enough.” The committee was following the matter closely. “It’s not unusual that surprises pop up during construction of major projects,” editorialized newspaper Dagsavisen, “but if it’s correct that a lack of advance work is the main reason for this budget bomb, that’s extra serious.” It called for an investigation into the entire project.